ALLIANCE, Ohio -- The Mount Union men's volleyball team defeated Hiram in five sets, 3-2, Tuesday night at the McPherson Academic and Athletic Complex. The Purple Raiders (2-5) claimed their first home-court victory in the program's history, winning by scores of 25-21, 23-25, 25-27, 25-23 and 15-12. Freshman opposite hitter Mark Bruns (Columbus/Upper Arlington) registered a season-best 21 kills while hitting .395 to lead the team. Freshman middle hitter Sam Matonis (Macedonia/Walsh Jesuit), sophomore outside hitter Justin Sibbel (Stow/Stow-Munroe Falls) and senior outside hitter Jordan Spurling (Columbus/Groveport Madison) all tabbed double digit kills on the night with 13, 10 and 10, respectively. Setting up the offense was freshman setter Jeremy Leyden (Cuyahoga Falls/Archbishop Hoban) with 51 assists. 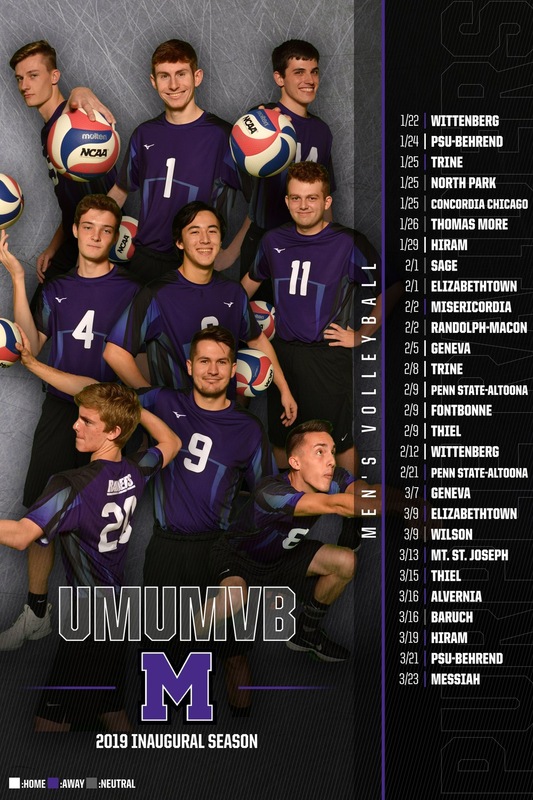 Defensively, sophomore libero Andrew Chen (Brooklyn City, Minn./Park Center Senior) accounted for 28 of Mount Union's 51 digs. Bruns was also strong at the net as he led the team with five total blocks. Hiram was led by Hunter Rock's 15 kills as they fall to 1-5 overall on the season. Mount Union won the first set, 25-21, after a 5-1 start on a service run by Steven Grenier (Hawthorn Woods, Ill./Lake Zurich). A pair of Mount Union errors and kill by Rock got Hiram within a point at 6-5 but the Raiders started to pull away to take their largest lead at 16-10, before going on to win the set. The Raiders once again controlled the start of the second set, leading Hiram 10-5. Hiram was able to spark a 12-7 to tie the score at 17-all. The two team exchanged long winded rallies until Hiram was able to hold on to their two-point lead and close out the set 25-23. Third set, Hiram and Mount Union were knotted up on 11 separate occasions. Mount Union's only lead of the set was at 10-8 after three service aces by Kaleb Krebs (Pittsburgh, Pa.). Hiram secured the win, 27-25, on powerful kill by Alex Andrejewski. Hiram jumped out to an early 3-1 lead over Mount Union to start the fourth set but a 3-1 run, capped by a service ace from Bruns, tied the score a 4-4. The Raiders were able to take the lead and extend it on a series of 3-0 runs. Hiram started to chip away and soon found itself within a single point of Mount Union, 24-23, but it would not be enough as Leyden and Bruns connected for the kill to take the fourth set, 25-23. Mount Union posted a 3-0 start to the fifth set. The Raiders were able to maintain their three-point advantage at 13-10 before a late push by Hiram cut the score to 13-12. Consecutive kills by Matonis and Bruns would close out the set with the Raiders on top, 15-13 and winning the match, 3-2. Up next, Mount Union travels to Dallas, Pa. for the 2019 Cougar Kickoff Classic hosted by Misericordia University starting February 1 against Sage (N.Y.) at 6 p.m.